After Conrad’s last day, we continued our botanical training with Alex and Ann from Devon and Somerset records centres respectively. It was actually really beneficial to go out with different people, as everybody has their own little tips and tricks to remembering different plants, and to be exposed to different peoples’ experiences of working in the environmental and conservation sector. One highlight from the month for me was encountering a new plant, Bog Myrtle (Myrica gale), which Kitty perfectly describes as smelling exactly like Christmas! Jon: We have reached the last 6 weeks of the traineeship! I can’t believe how quickly the last 6 months has flown by! September has been a whirlwind of activity with lots of varied training and lots of changes. Following on from the August blog we caught a number of signal crayfish at the beginning on the month, which went down very well at the staff BBQ that night. With the news of Conrad moving on to another job, this week saw the last of our training with Conrad which was very sad all round. 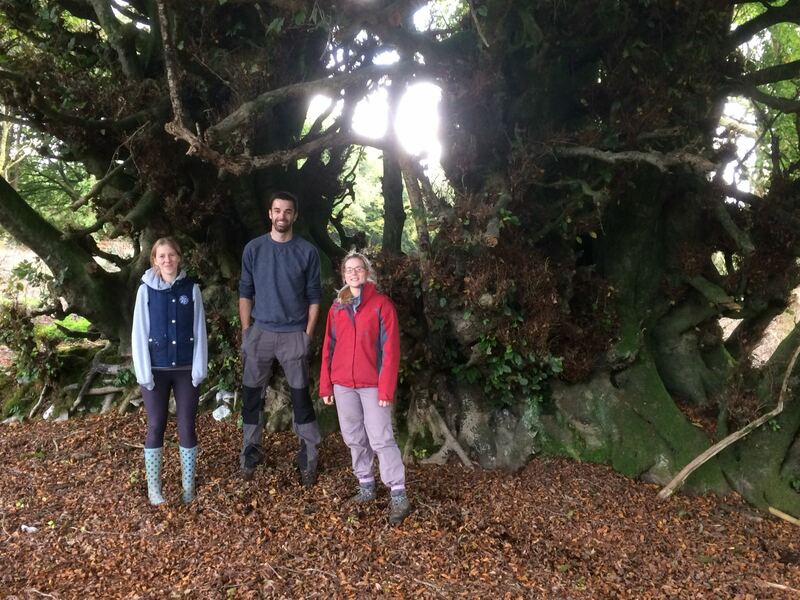 However, with every cloud comes a silver lining in the form of Alex and Ann from Devon and Somerset Records centres who very kindly took us out for the final botanical surveys of the year. It was a great insight into how different records centres approach surveys and very enjoyable. Later on this month we undertook a day of otter training. This was extremely interesting, both learning about an animal I know little about but also going down the river looking for otter signs, which cover the edges of the rivers. Kitty: September had many great parts and some not so great. Our leader, Conrad, had his last surveys days with us this month, it was very sad to see him go after such a great fun and busy summer, but we were also all very happy to see him leaving for a job perfectly suited to him! The highlight of the month for me has got to be Conrad falling into a very deep and stinky bog!!!! Jon and I did help him out but only after taking a photo!After Conrad left the botanical surveys continued, we went out with ecologists from the Devon Biodiversity Records Centre as well as Somerset Environmental Records Centre, unfortunately some of the days were pretty wet but we did get to go to some interesting sites and see some new plants such as Bog Myrtle, which I think smells like Christmas. My favourite surveys this month has to be a Dormouse nest box check; we found a mother with five juveniles, I was so pleased to be able to do the handling, it was definitely the highlight of the project for me! They were all a healthy weights and hopefully will survive the winter! One Friday we took part in a specialist training day, Fresh water invertebrates! We spend the morning looking at the theory behind water quality and how inveterate indicate the quality of aquatic habitats, we then conducted to a practical session in the river collecting samples and ended the day by analysing our samples under microscopes. All the little bugs were fascinating and look spectacular under a high powered microscope! This month we also had a staff BBQ, we took along some crayfish which we had caught during a survey in Culmstock. If I am completely honest, they didn’t taste great at all!